we got some decent press off the opening. And I went to the middle school today and interrupted 7th grade lunch to give the winner of the essay contest the bike that one of our old friends donated. Then I managed to get 1:45 minutes of meandering around on my own. After I pick RTR up at school, it's pump track time until we tarp it before the monsoon thats headed our way. It is indeed a great time for bikes. That project and the end result is so great. Good for you Chip, and the rest of the folks who organized. Really glad there are people such as yourselves out there doing the good work. For a bunch of fat old dudes we did alright. We aren't done with the bigger jump line yet, but we certainly met the "riding something by October" goal. I really couldn't be any happier with how it's going. Having the itch for some winter projects. Anyone have any older mountain bikes looking for a little cash or to make space let me know. Preferably in the 17”, 18”, M, M/L range. Thanks! Thats awesome. I dont think i knew this was being built. Really nice that people have the interest and i dont know how you all handled the town meetings without bursting a blood vessel. Well, the board of public works was nothing short of amazing to work with. They logically had some questions, but we came with it in the end, and they’ve been really supportive and extremely helpful dropping off full upon request (we’re buying clay for the top coat, to pack with), and anything else we’ve needed, signage and the like. After it was approved and the neighbors caught wind of it they started a petition and put up a stink (and faced some pretty harsh backlash on social media), there was one meeting for them to air their grievances that was tense. I actually missed that one because I was at work, which is probably for the better. But since we’ve got going at the site there’s been nothing but positive feedback from every passer by, including some that fought it to begin with. We were steered towards this spot, out of the way, and did our best to tuck it in behind a pump house so it wouldn’t be an eyesore. We want to make it awesome, without disrupting anyone’s day to day in the neighborhood, and certainly without it being seen as anything less than a positive thing for the community. Not knowing anything about pump tracks does the clay get slick on humid days? Guessing riding/playing when it is raining isn't a good idea? Would it damage the track, or is it packed so well that it isn't a big deal? The short answer is: depends. It doesn’t really get slick on humid days, but it can get sloppy when it’s wet. Yeah, riding when the place is waterlogged is a big no-no. We’ve done some drainage work so the water has someplace to go, in addition to tarping the thing when we know it’s going to rain. We’ll see how well we did by late Friday or Saturday once this next pour goes by. There were some low spots left that we raised, but that only means that water has to go someplace else. It’ll take some fine tuning to get right, but at the end of this we hope to have everything running off to either the sump that we dug, or to the borders, and no standing water left that can’t just be swept out with a push broom. That’s optimistic right now, but we’ll get there in time. I have an old Marin aluminum frame hard tail and solid forks bike that needs gone. It is nothing to be proud of, never ridden and was cheap buy 20 years ago. Chrome frame, super cheapo components, etc. You are really only getting a frame and forks and bars, maybe wheels are good?? It's yours if you want it. I think the size is L or M. I've tried to get in contact with some of these bike donation programs but they seem to be flooded with old bikes already. i have a 1991 Cannondale SM700 i've had since new. can't seem to part with it because i still love it... but don't think my Phase2 life-plan for it will ever be realized. did you look into any of those top-coat options that you can paint on? always wondered if those hold up over the years. Yeah, we’ll be looking into a product called soil-tac as well as some home brew type stuff dirtjump dudes use after we’re all done. No promises there. will there be a shutdown/startup date where the track gets tarped for the winter or is the tarping going to be on and off all the time based on the rain?...also just curious as to what type of clay was put down? Last edited by Point37; 10-11-18 at 03:17 PM. we'll do the on/off thing with short term weather, and put it to bed for the winter at some point. Re-opening seasonally will depend on thaw and all that happy horse-hay. So I've been riding with peeps in nh. I think I need a fat bike for the winter. Know of any for sale? Might sell my yz125 to fund it. You do need a fat bike. Then you can build a set of 29” wheels for it too, and have 2 bikes in one. I just rode mine 95miles today along the Great Allegheny Passage Trail. Today was day two of a Pittsburgh to DC ride. Because none of the camp spots within the next 20 miles of here have shelters, I’m in a hotel. So good. I looked and looked and looked when I was in the market, nothing popped up. Bought a bikesdirect one that I have been happy with. If I were to do it again I would NOT get the suspension fork. Not really needed in the snow or sand, and I have more fun on the skinny bike all other situations. It does make it a better buddy bike I suppose, but with a 30" standover not many can ride it comfortably anyway. Sent this guy a message. Cool bike but on the heavier side, which is what kept me from picking one up. Well that one is sold. Talking to the guy with this bike now. Any experience with the nuvinci internal hub? Looked it up on wiki. Really cool design. Those hubs are pretty neat in how they work. Not sure about on a snow bike, and that frame looks way small. I think you’d want like a 17/18”. What are you looking to spend? I could probably give you a good deal on the orbea Loki I have. It’s got 3” tires so they kind of refer to it as a mid-fat tire. Last edited by bryco13; 11-06-18 at 10:53 AM. Shoot me a PM with a couple details, a pic, and what you have in mind for $$ please. Just talked to the guy at the LBS about the NuVinci. He said to stay away unless you're rec riding. Great Allegheny Passage to Chesapeake and Ohio towpath. 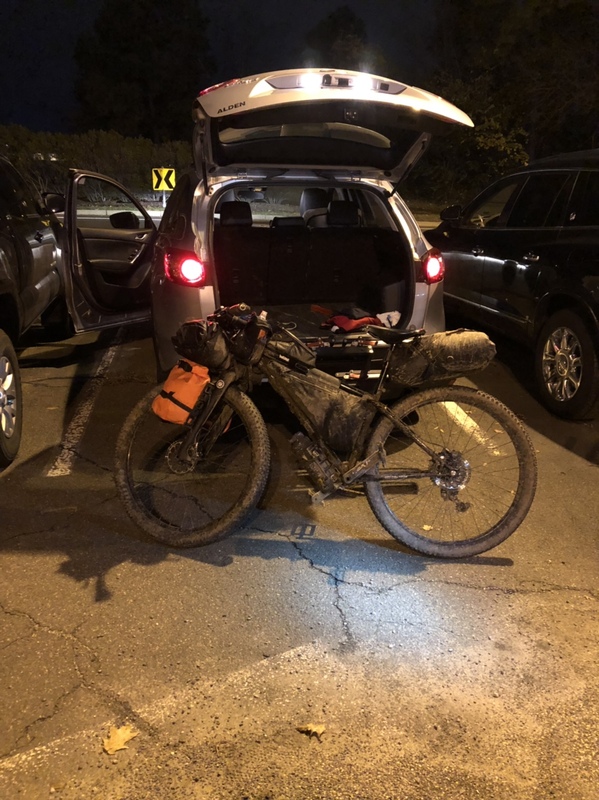 Pittsburgh to DC all off-road except cruising around various towns for supplies and whatnots. First tubeless bike. Front inflated fine. Rear seems to be leaking at the bead in multiple points. Don't know what to do. Does it need liquid? Page generated in 0.243 seconds with 18 queries.